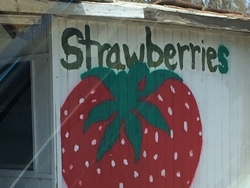 We have a strawberry stand on a busy east-west thoroughfare on the south side of town. They keep decent hours, stay relatively busy, have so-so strawberries, and are expensive. West and south of town on a country road is a strawberry stand that keeps irregular hours, grows strawberries on site, has the best, sweetest strawberries you can imagine, and charges half the price of the other stand. You have to time it right, however. On Friday Terry and I were going to have lunch at Jersey Mike’s. Terry wanted to stop by Lowe’s afterwards. And we were going to get strawberries. We left ten minutes earlier for lunch than the original plan. After lunch Terry said we could do Lowe’s later. We headed for the rural strawberry stand. I was one of the last to get strawberries before they shut down for the day. Had we waited another ten minutes to go to lunch and/or gone to Lowe’s we would have been out of luck. Instead we came home with a three-pack of fresh, sweet strawberries picked literally just minutes before.